Hello everyone, and Happy Wednesday to all! We want to thank you all for participating in our Contest , and also let you know our next Giveaway will be on Oct 5th, we will be doing a Halloween Hop, so be sure to stop by and join us for some fun!!! thank you for all your sweet & wonderful comments!!! 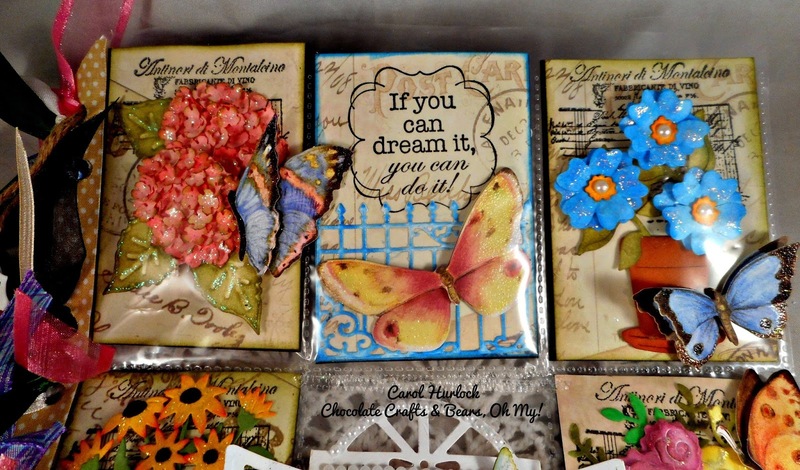 Please email Joanne at scrappingcottage@cox.net to claim your dies! We want to THANK all of you for your sweet comments, they really do mean a lot to the designers, so thank you again!!! Greetings everyone it's Carol. 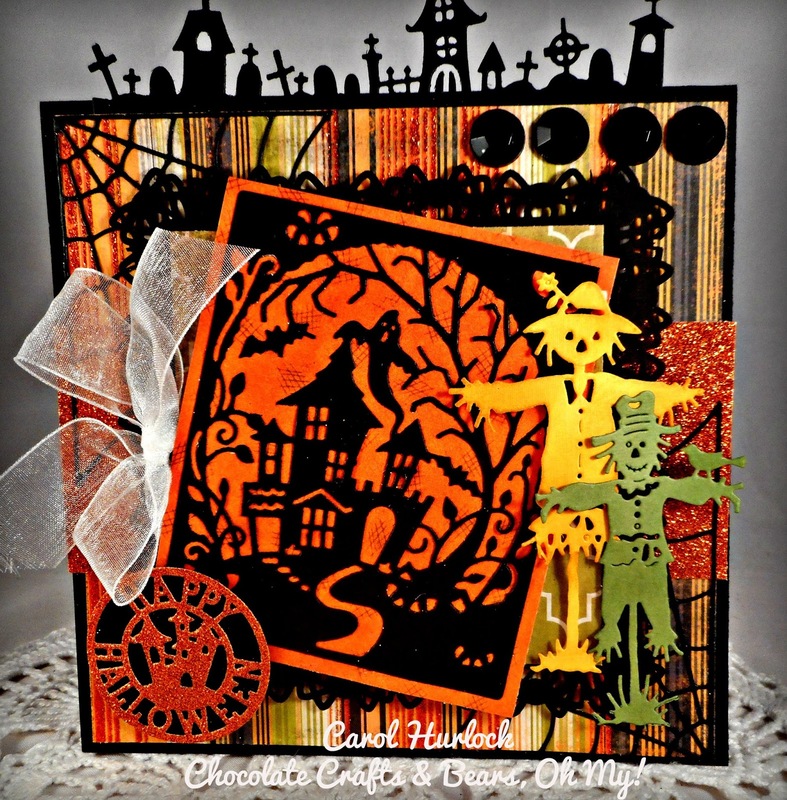 Today's creation features beautiful Halloween CottageCutz dies in an exciting array of shapes. 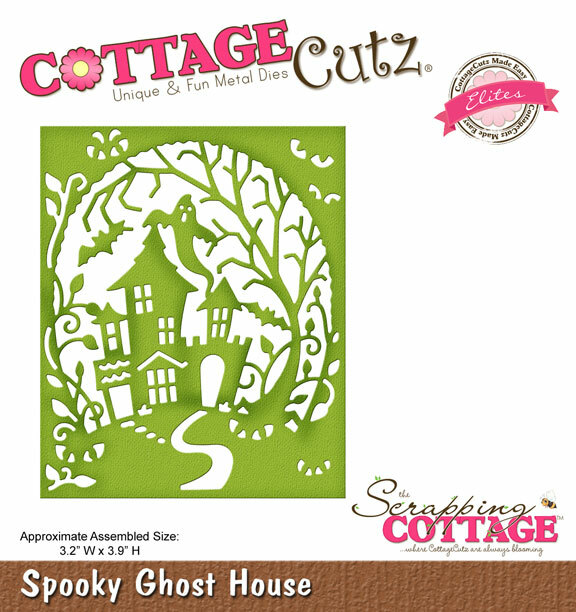 The main focal point of the card is CottageCutz Spooky Ghost House. Isn't this fabulous. 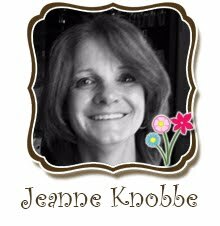 Just cut out your die on black card stock and mount it on a piece of orange cardstock that is 1/4" larger than the die to make it pop! 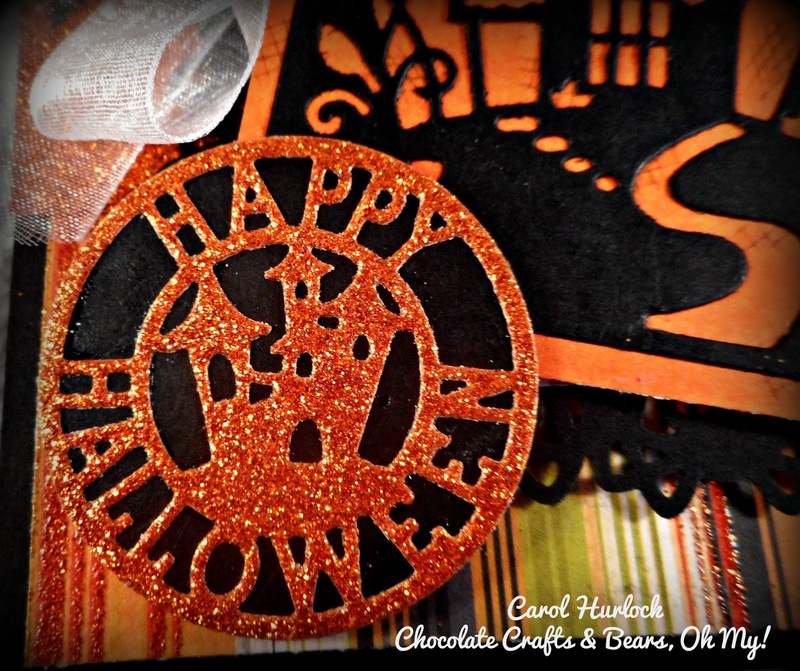 For the CottageCuz Halloween Tag the die was cut on orange glitter paper. 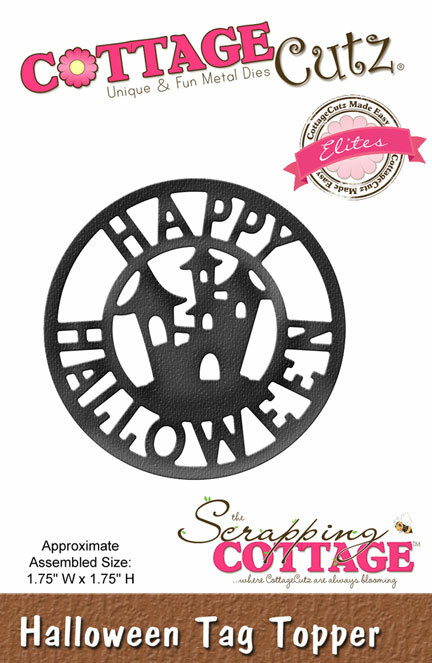 After die cutting, just take the die and trace around the outside on black paper and cut with scissors. Mount the orange glitter die cut on top and you have this awesome contrast. 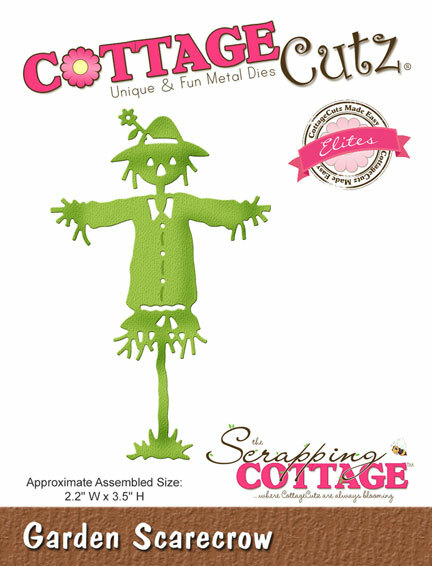 The green scarecrow is the CottageCutz Harvest Scarecrow. 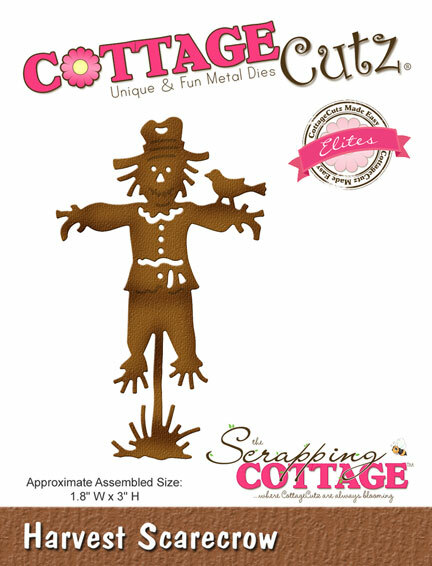 The Gold with Brush Corduroy distress inked scarecrow is CottageCutz Garden Scarecrow. 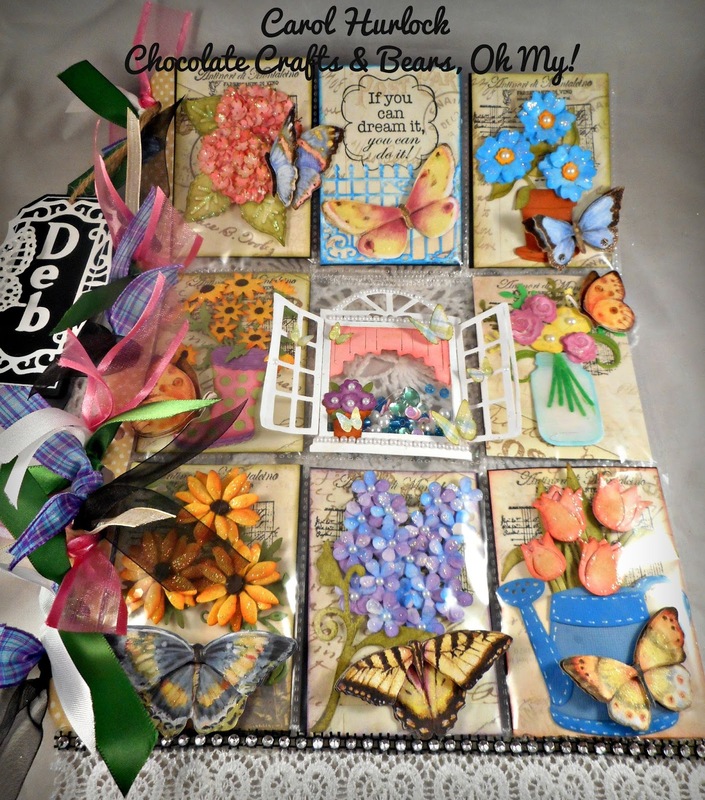 The top border is CottageCutz Graveyard Border. 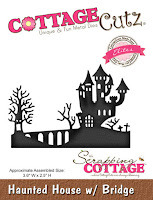 Be sure to comment on the CottageCutz BLOG as we are doing a GIVEAWAY to 1 lucky person! 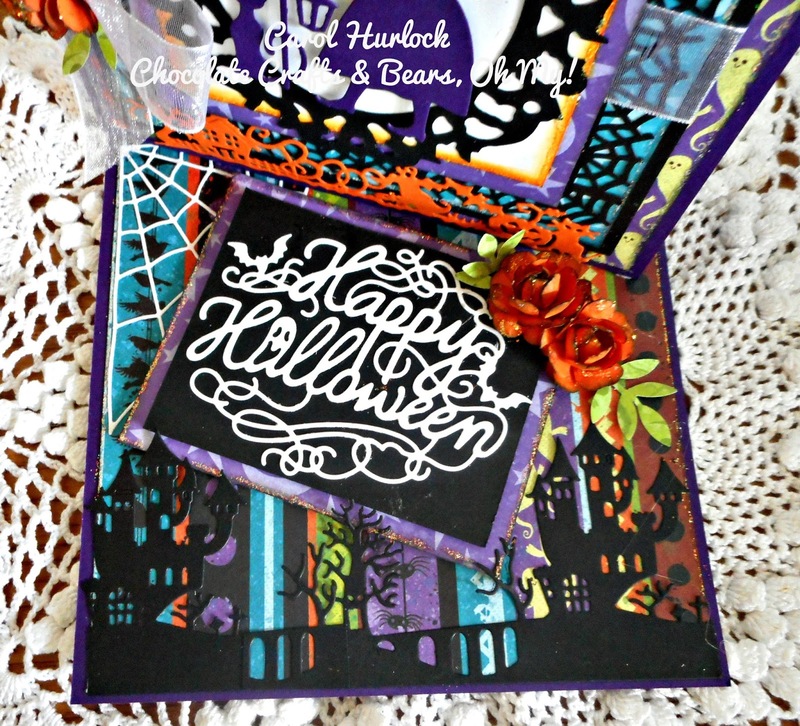 You can WIN 2 of the NEW Halloween dies!! Whooohooo, super fun!! 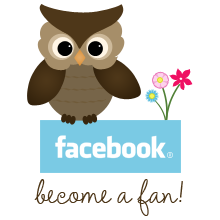 Leave a comment here for your chance to win. Winner will be announced September 30. Have fun and Good Luck to all! Fall is here and also Halloween will be here soon. 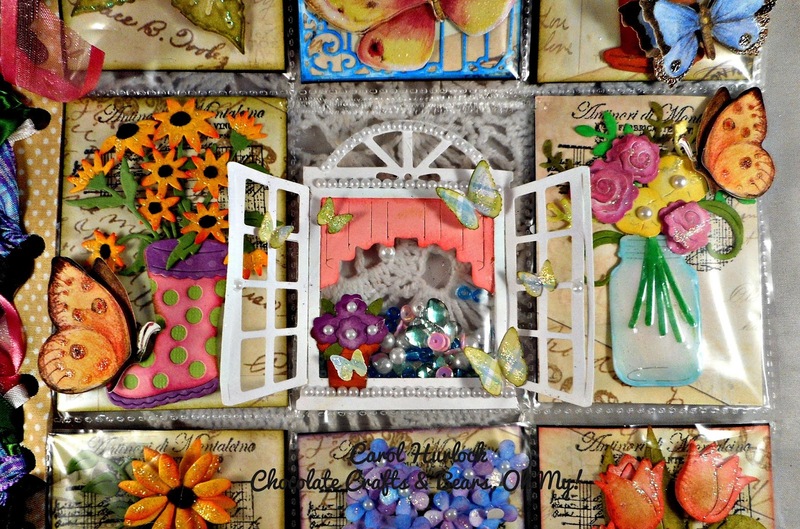 You can find a lot of inspiration here on CottageCutz blog and I have one for you today too. 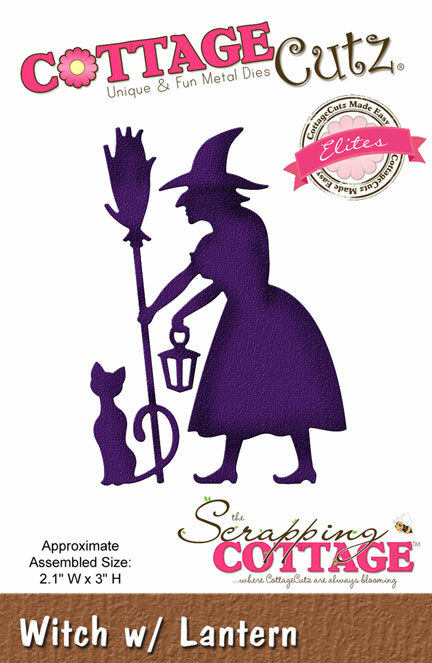 I used this Witch on Broom. She is on her way to cool witch party. I made this background with watercolor paper and different Distress Inks. I started with Peacock Feather, put it on my craft sheet, added some water and put paper on, to get some splodges. then I dried it with heat gun and used another Distress Ink, this time Chipped Sapphire and repeat the whole step. The last Distress Ink which I used was Black Soot. After everything was dry I used also white tempera and brush to made some paint splatters which look like stars. The moon is made the same way as background, but this time I used just Weathered Wood Distress Ink and after that cut the moon out with circle die. 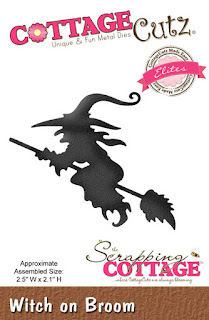 The Witch is cut out of black cardstock and sentiment was created in Word and printed on paus paper. Yellow stars and clouds are cut out with Baby Sleeping on Moon die. This is my card for today. Have fun. 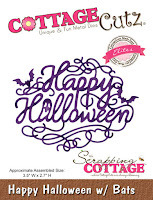 And be sure to leave a comment on all of our post from 9/8/15- 9/23/15 on the CottageCutz BLOG as we are doing a GIVEAWAY to 1 lucky person! 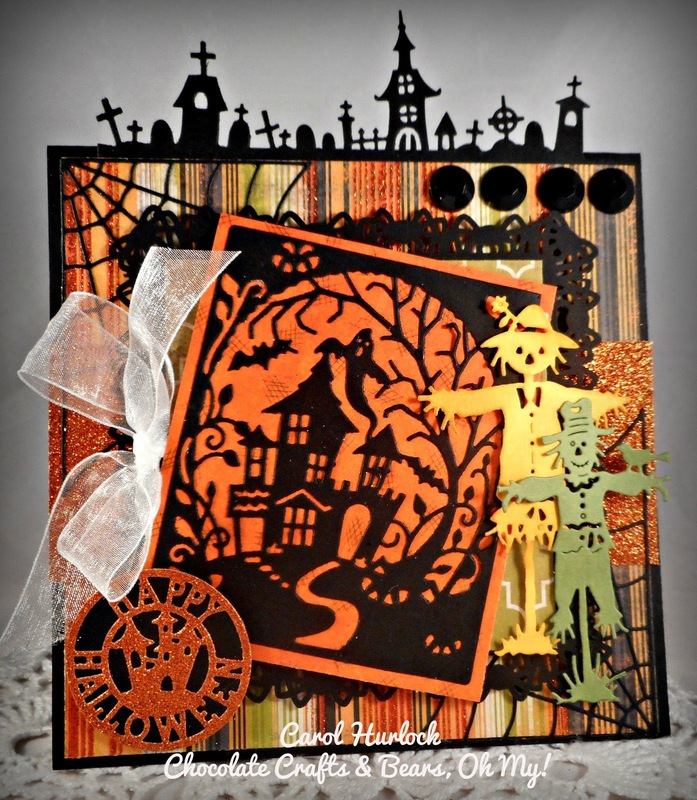 You can WIN 2 of the NEW Halloween dies. Here you can find more. Hello everyone. 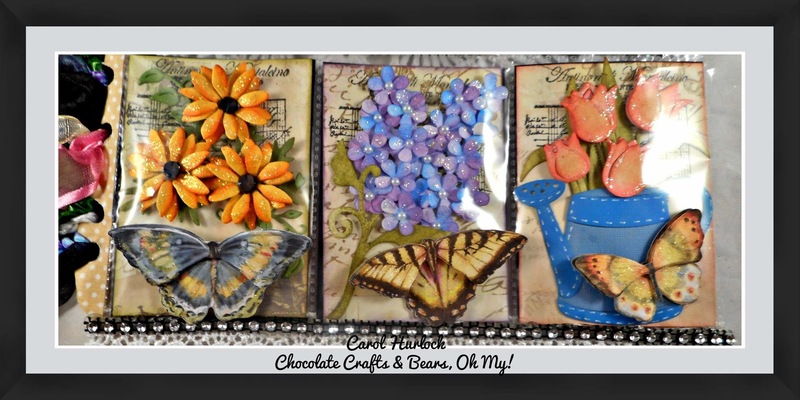 Today it's Carol with a project share featuring tons of CottageCutz dies. Pocket Letters are a wonderful way to use your CottageCutz dies. They fit perfectly in or on the pockets of these plastic sleeves. The middle pocket uses CottageCutz Ornate Fence. Pocket #3 is CottageCutz Flowerpot Mini, and Flower Mini. I used some Butterfly Embellishments. 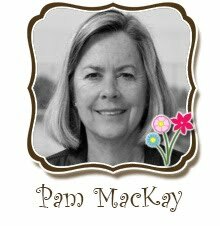 For the center of the pocket letter, Pocket #4 has CottageCutz Daisy Showers. The Center Pocket is a shaker and it features the CottageCutz Springtime Window. Pocket #6 features CottageCutz Flower Bouquet Jar. 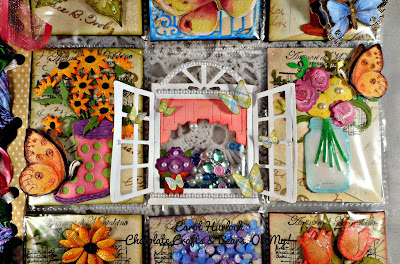 Pocket #8 is the CottageCutz Flower Cluster die. 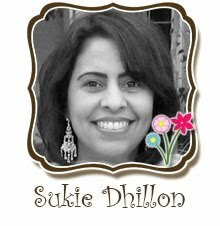 Pocket #9 is CottageCutz Watering Can with Tulips die. 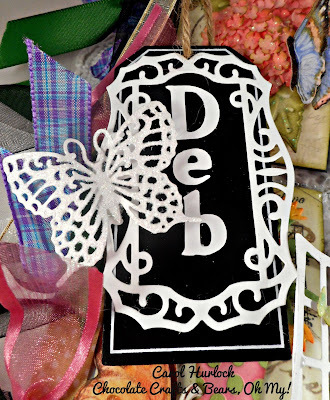 This is a tag created to dangle on the Pocket Letter. It's a blackboard tag that comes from Michael's. A Cricut alphabet cartridge was used to create the name. 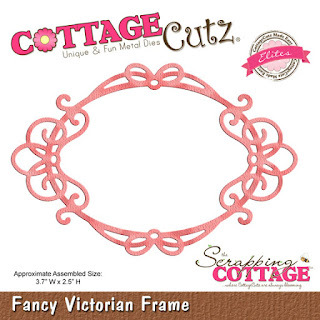 The CottageCutz Victorian Frames was used to decorate the tag. 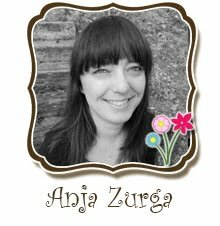 The butterfly is CottageCutz Garden Delight. As you can see, CottageCutz dies are absolutely perfect for creating Pocket Letters. Thank you so much for stopping by to check out this Pocket Letter. Until next time, Happy Crafting. See you soon! 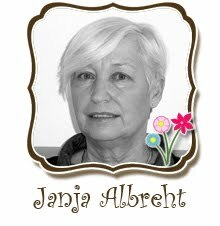 welcome to CottageCutz Blog with new CottageCutz project on from me (Olena). 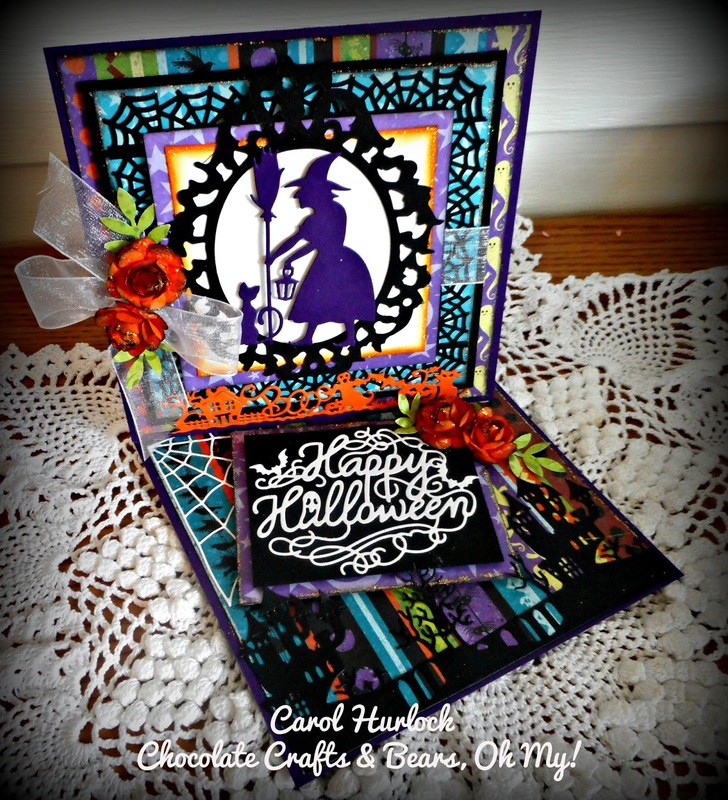 I created with boooooeautiful NEW CottageCutz Halloween Release. The finished card measures 4" x 5 1/2" (10.5 cm x 14 cm.). To make card, start by cutting black card stock 5 1/2" x 8 1/2", score at 4 1/4" and fold crease to make card base. Next, cut orange and cream card stock in different sizes. 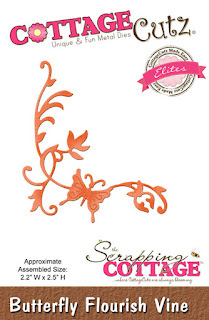 Using embossing folder embossed orange piece. After all, glue cream and embossed orange piece together. 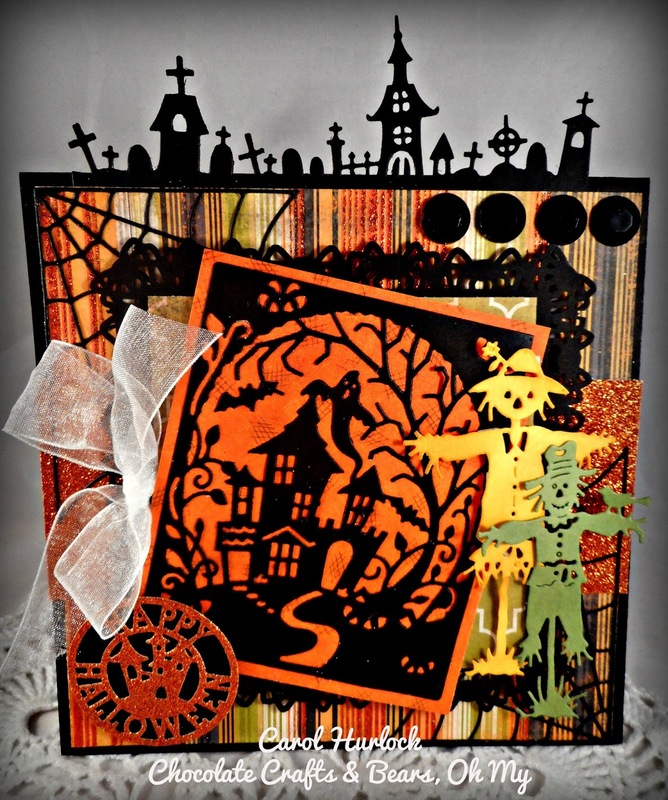 Decorate panel with orange ribbon and button (how show on picture) and glue to black card base. The next step is Halloween vine panel. Start by cutting orange card stock using the Halloween Vine die. Glued vine to black panel and cream base. Decorate vine with Stella brush clear glitter. Putting Vine panel to card and add sentiment. 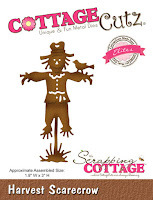 Be sure to stop by the CottageCutz BLOG as we are doing a GIVEAWAY to 1 lucky person! 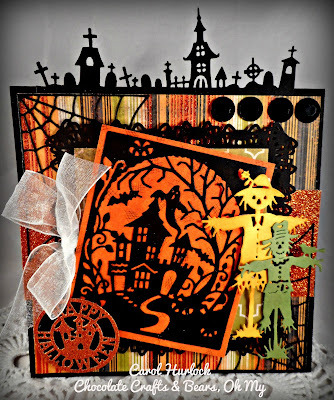 You can WIN 2 of the NEW Halloween dies!! Whooohooo, super fun!! 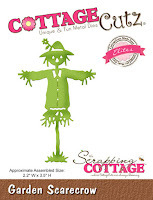 Here is a LINK to the CottageCutz Blog! Have fun and Good Luck to all! Other: Wink of Stella Brush clear glitter, scissors, paper trimmer, scor-buddy, craft glue, pierce tool, ribbon, button, Dew Drops and embossing folder. Thanks for visiting, I hope your day is wonderful! 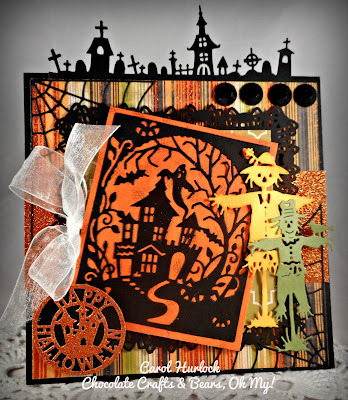 For this 1 page I used 4 of the CottageCutz Halloween Dies from the NEW Release. CottageCutz Graveyard Border,CottageCutz Witch on Broom﻿ , CottageCutz Witch With Lantern , and CottageCutz Halloween Night Scene. 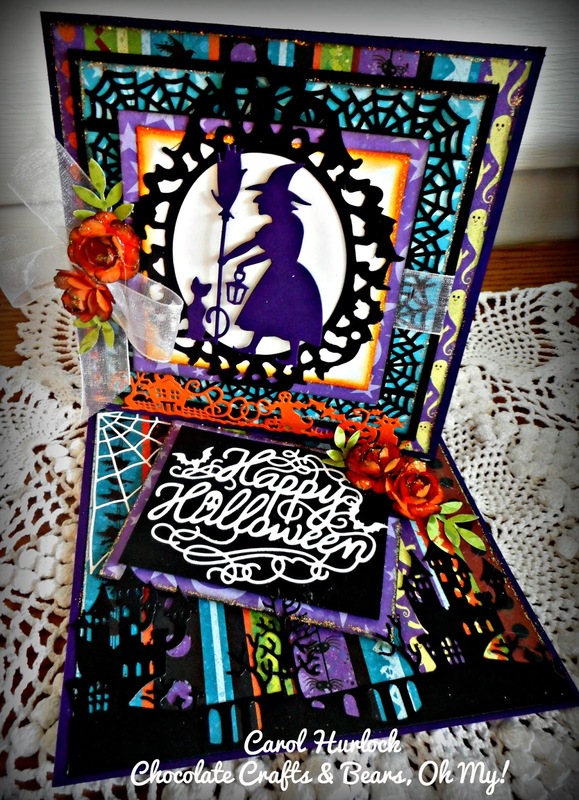 All cut using Black Card stock, super EASY! Love how this page turned out. 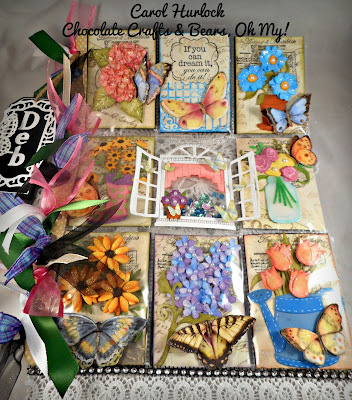 I just added some gingham ribbons, and a tag to complete my page. 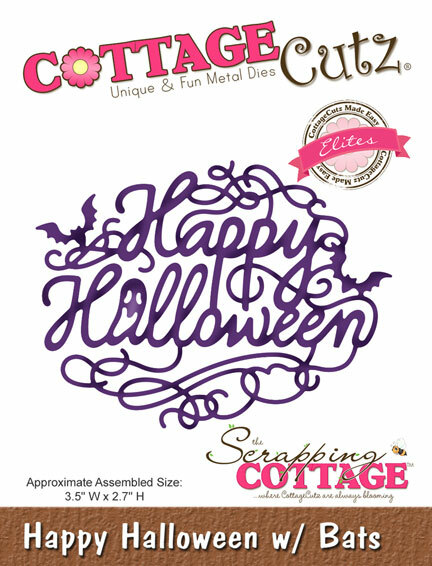 Don't forget to leave a comment to be entered to WIN 2 Free CottageCutz Halloween Dies!! Fall is in the air. Can you feel it where you are? Hello everyone it's Carol. Welcome to another CottageCutz creation. Today the featured dies are from the Halloween release. For this card the Witch w/Lantern, Haunted House w/Bridge, Happy Halloween w/Bats, and Spooky Border were used. This card is called a "Twisted Easel Card". 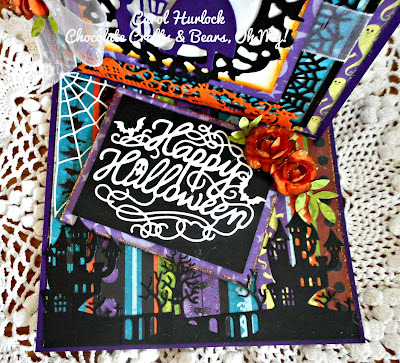 The colors in this Halloween Paper are really fabulous are papers from an older K& Company pad. The black paper makes all the colors really pop. Thank you so much for stopping by today. It's really appreciated. Until next time, Happy Crafting. 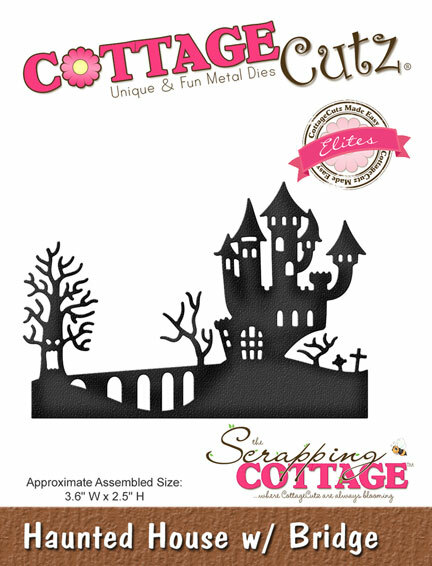 Be sure to join us for our Giveaway, as all Commenters will be entered to WIN the 2 Halloween CottageCutz dies below!! Have fun and good luck to all! Today I have gentle white-green card for you, easy to make. 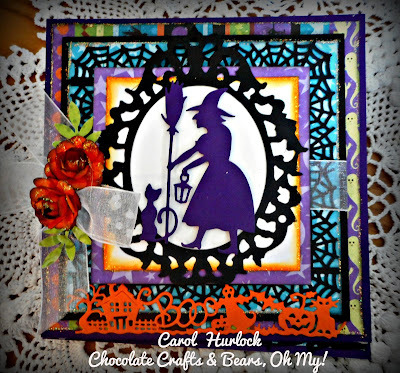 My card base is cut out with die and background is made with impression plate. 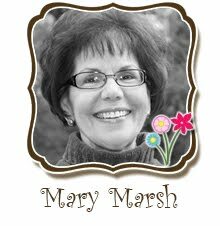 But you can use 4 by 5 3/4 inch white card base and cut out one more peace of cardstock a little smaller as card base and embossed it with embossing plate if you want. 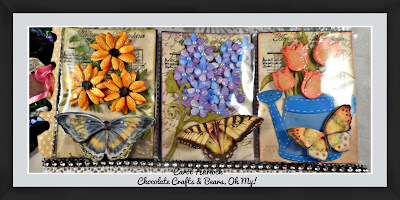 Butterfly Flourish Vine is colored with Peeled Paint Distress Ink and Fancy Victorian Frame is cut out four times and glued on top of each other. I did the coloring and the frame the same way as with die cuts here in this post of mine, where I created birthday wreath. Butterfly is cut out one more time and glued on top of Butterfly Flourish Vine. I also did some stamping in corners and the sentiment of course. This is it for today! 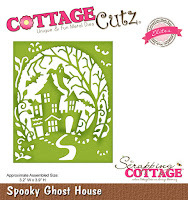 CottageCutz Ghost Owl & Giveaway!